The backrest and armrests of the Cestone Sofa are framed in satined, chromed, burnished, or black chromed metal with leather panels. Hide-leather is available in Russian red, white, olive, black, dark brown, dark brown extra, gray, sand and tobacco. Suede is available in black, dark brown, olive and sand. Back, arm and seat cushion filled with down and a reslient inner core. Optional down filled throw pillows. Upholstered with removable fabric or leather covers. Back and sides have optional leather woven panels. Price includes shipping to the USA. 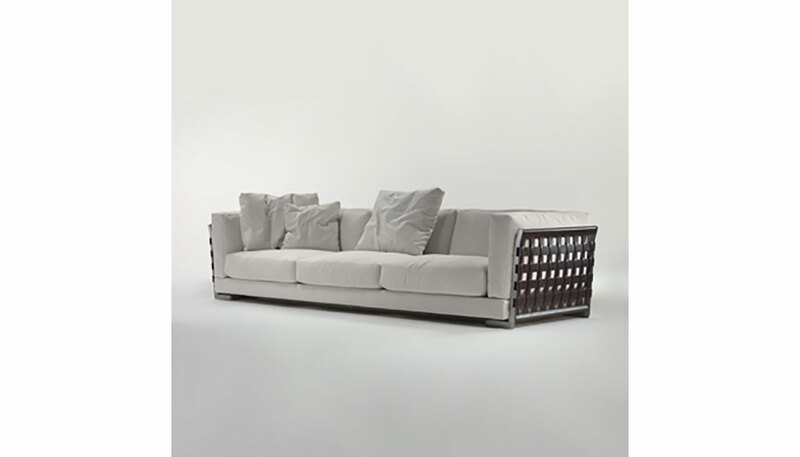 Many Flexform designs feature removable upholstery covers. As such, additional upholstery covers or replacement covers for an existing Cestone Sofa are available. Please contact Switch Modern at 404-605-0196 or info@switchmodern.com for pricing and options. Manufactured by Flexform.